The 2008 ride will begin in Las Vegas. The route will take the riders through some of the most breathtaking scenery in southern Utah, Colorado and Arizona before heading back to Las Vegas. Las Vegas, via I-15 to Mesquite, St. George, Washington, Hurricane, Virgin, Rockville, Springdale, Zion. Zion via State Road 9 to Mt. Carmel Junction, 89N to Orderville, Glendale, Long Valley Jct. to SR12 to Bryce Canyon. Bryce Canyon via SR12 to Tropic, Henrieville, Escalante, Boulder, Grover, Torrey; via SR24N to Cainville, Hanksville to I-70 to Brendel, via SR191S to Moab. Moab via SR191S to La Sal Jct., then SR46, which becomes 90 (in Colorado), Vancorum to SR145 to Naturita, Redvale, Placerville, Telluride, Rico, Stoner, Dolores, to SR160E to Mesa Verde. Mesa Verde via SR160W to Cortez, Four Corners (for pictures with appendages in all four adjoining states), Teec Nos Pos, Red Mesa to SR191N to SR163W to Kayenta. 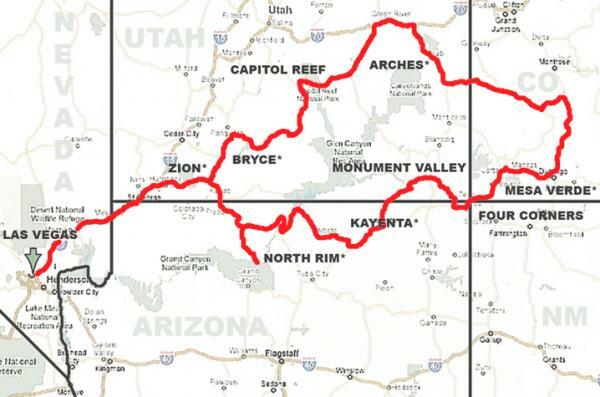 Kayenta to SR98 to Kaibito, Page, to SR89S to Alt89, Marble Canyon, Jacob Lake, North Rim. Possibilities for this day include a 2 hour stop near Page to visit Antelope Canyon. North Rim to Jacob Lake, Fredonia, Kanab, Mt. Carmel Jct., Zion, Springdale, Hurricane, St. George via I-15 to Las Vegas.This takes us back through Zion, but the vistas are entirely different going in that direction. The alternative is to go west at Fredonia, through Colorado City to Hurricane and so on. Either way, it's less than 300 miles and a little over 5 hours total for the day. With an early start we could be in Vegas by early afternoon.